By David Epstein. Published by Thomson West. 2013. 8th. By Socrates Media. Published by Socrates Media. 2006. This comprehensive personal aid title walks through different types of bankruptcy, the process of filing for bankruptcy, and advice for next steps. By Stephen Elias and Robin Leonard. Published by Nolo Press. 2018. 14th ed. By Alan Resnick. Published by Lexis Nexis Matthew Bender. 1981. 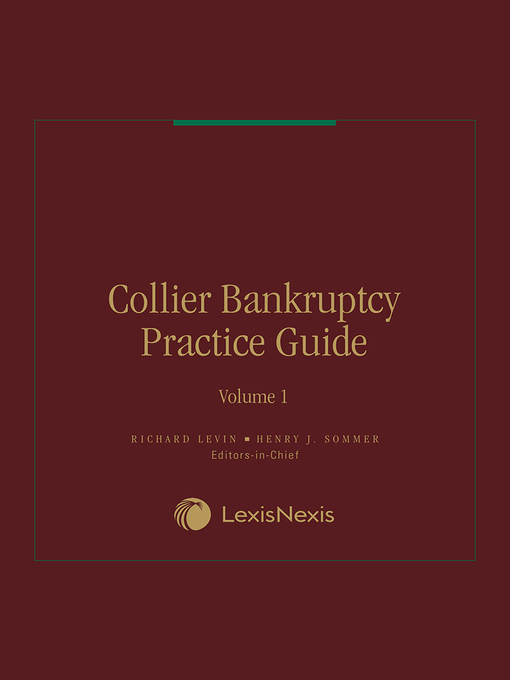 This multivolume practice guide covers preparation and filing for bankruptcy proceedings. It also covers trustee appointments and their powers, bankruptcy claims, debtors rights, reorganization, debt adjustment, and the appeals process. By Alan Resnick. Published by Lexis Nexis Matthew Bender. 2009. 16th edition. 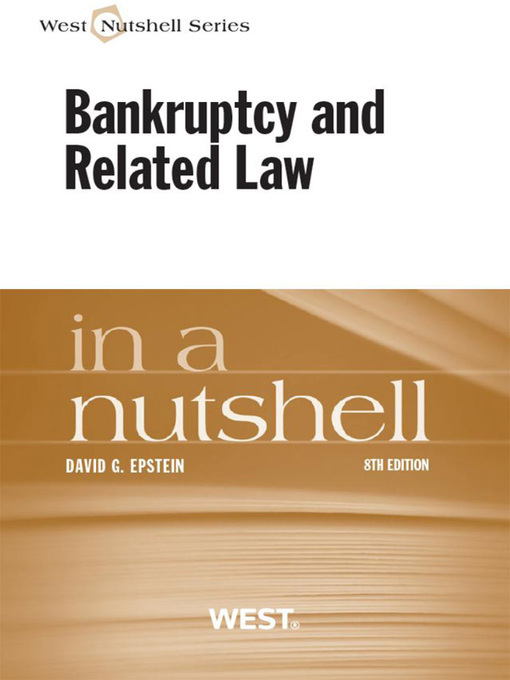 This multivolume set covers in depth a wide range of bankruptcy topics. Information includes details on the bankruptcy court system, bankruptcy code provisions, case administration, creditors & debtors, liquidation, reorganization, and the Federal rules of bankruptcy procedure. Due to publisher restrictions, this title can only be checked out from home by government employees. Members of the public must visit the library in person to view this title electronically or in print. We apologize for the inconvenience. By None. Published by Lexis Nexis Matthew Bender. 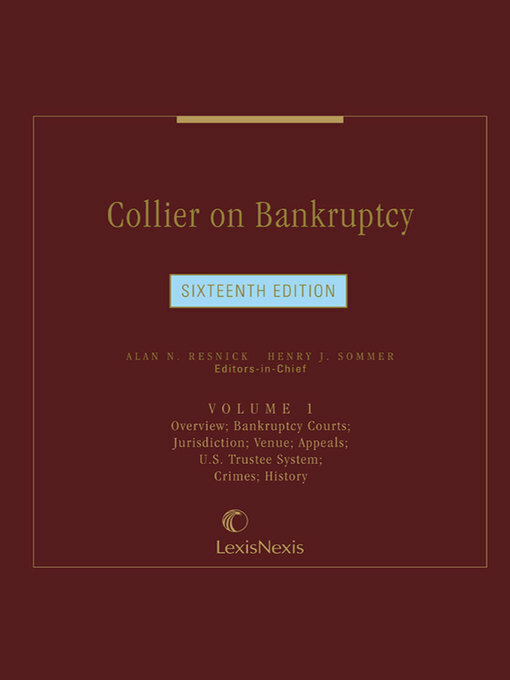 Provides desktop access to the full text of the Bankruptcy Code and the Federal Rules of Bankruptcy Procedure in an easy-to-use, quick-reference format, along with invaluable commentary and case summaries. By Martha Maeda and Maurcia DeLean Houck. Published by Atlantic Publishing Group, Inc. 2009. This title walks you through the legal options you have in avoiding foreclosure on your home. Strategies for obtaining legal advice, keeping current on mortgage payments, filing for bankruptcy, and more topics are covered in this guide. By Henry Sommer. 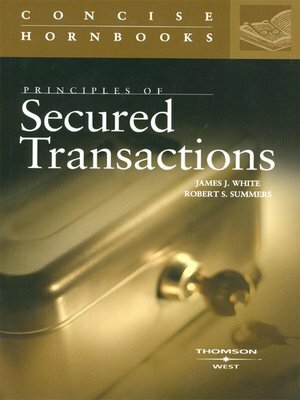 Published by National Consumer Law Center. 2016, 2017. 11th edition. This manual is a basic resource for both attorneys and paralegals when handling bankruptcy cases. The author focuses on serving consumers with low and moderate incomes. Topics covered include the different types of bankruptcy, determining when bankruptcy is the best solution, exemptions, secured creditors, attorney fees, and litigating in bankruptcy court. By Douglas Baird. Published by Foundation Press. 2014. 6th edition. By Stephen Elias & Albin Renauer; updated by Baran Bulkat. Published by Nolo Press. 2017. 20th ed. 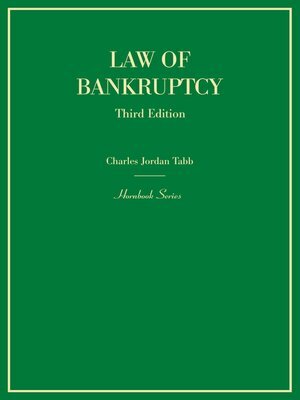 "Guides readers through the bankruptcy process, explaining bankruptcy law requirements and providing line-by-line instructions for filling out the necessary forms." By Tracy Alexandra Carr. Published by Atlantic Publishing Group, Inc. 2009. This guide helps to provide practical advice for rebuilding life - financially and personally - after bankruptcy. By Charles Tabb. Published by Thomson West. 2014. 3rd ed. By James White; Robert S. Summers. Published by Thomson West. 2007. 1st ed. By Stephen Elias. Published by Nolo Press. 2015. 5th ed. By Stephen Elias. Published by Nolo Press. 2017. 7th ed. This guide from Nolo helps readers determine if they qualify for Chapter 7 or 13 bankruptcy, how repayment plans work, and how bankruptcy affects credit. 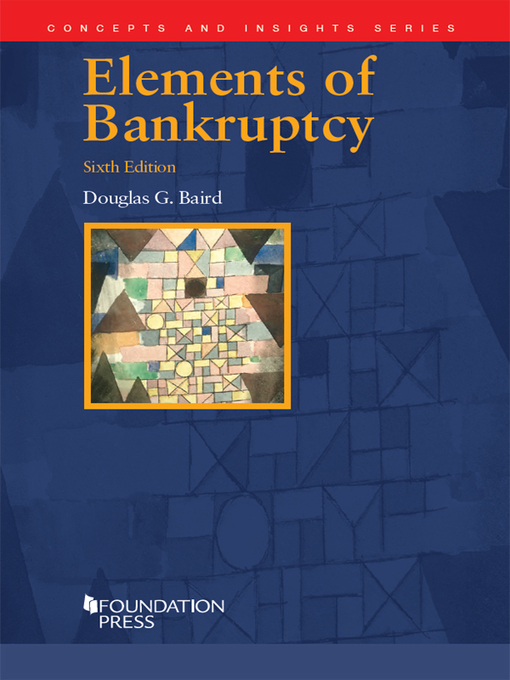 The 5th edition includes updated state and federal exemption tables that explain which assets may be kept once bankruptcy is filed, along with worksheets, checklists and sample forms.